He's on record as saying he didn't think anyone could hear it because of the big crowd roar and that there weren't any mic's immediately around him. I think he even said something such as "please don't fine me too bad PGA tour. I didn't think anyone could here me and it was out of celebration not anger." I try very hard not to be cynical, though I remain skeptical. He's no Tour rookie, nor is he a stranger to microphones. I do believe he doesn't want a fine. I believe slightly less that he was convinced no one would hear him. To be clear, though: I'm not expecting all the guys on Tour to be choir boys. 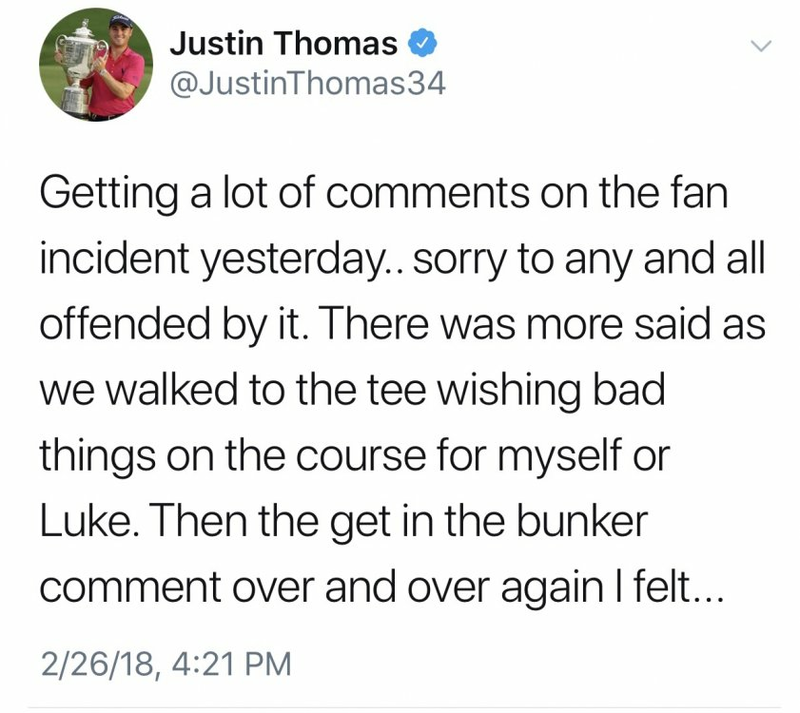 I do think that JT himself has a consistency issue when he chooses to endorse a fratboy approach to golf and then objects when the gallery takes him up on his suggestion. But why would he say it if he thought the cameras would pick it up? That means a fine for him if its heard on TV. Its not like he screamed it or even raised his head when he said it. JT endorses the "fratboy" approach only spring break trips. Which is away from tournaments and in his own personal time. Some of which he shares on social media. I can't remember him ever doing anything I'd consider "fratboy" like on the course during an event. Am I forgetting something? A club toss or whining is about the most egregious thing I can remember but that doesn't mean I'm forgetting something. This is some pretty solid maturity right here. 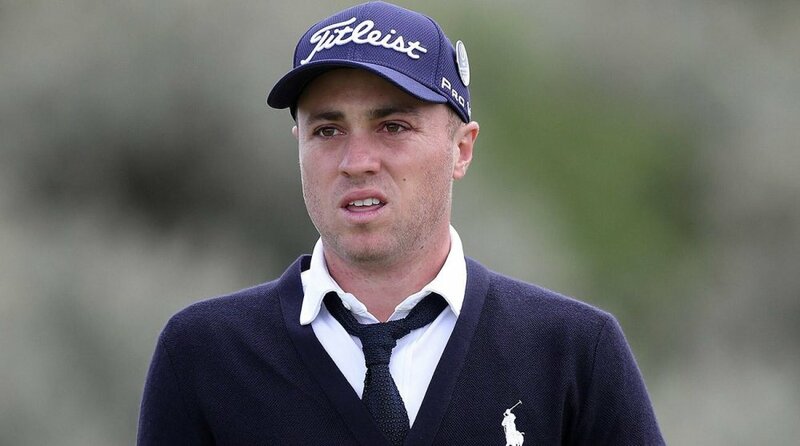 I was on the fence about JT because he dresses kind of sloppy and is "best buds" with Spieth......but I dunno. I think I'm pushing more to the side of liking him after this. Edit: Oops, there was MUCH more to this tweet. Some one needs to teach home boy how to do threads. â€œdresses kind of sloppyâ€?!? Really? 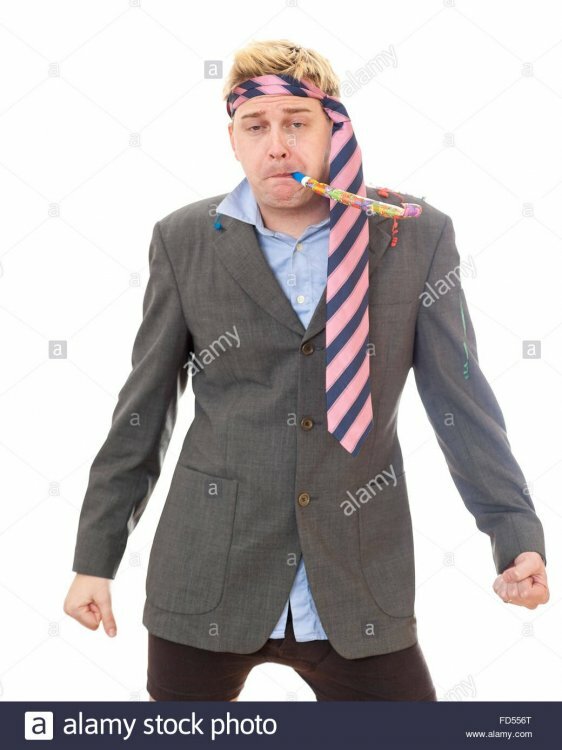 This is most certainly not how you wear a tie. Oh; more like this what you had in mind? I don't mind JT in general, but he needs to know when to control the tongue. You think the green jackets at Augusta wouldn't pull him aside after his round if he let something like that slip out? These guys know there are mics all over the place picking up everything. If they don't know this, then they've never watched a broadcast. C'mon man. I'll swear when I play with my pals, but not with the kids or my dad. Time and place. 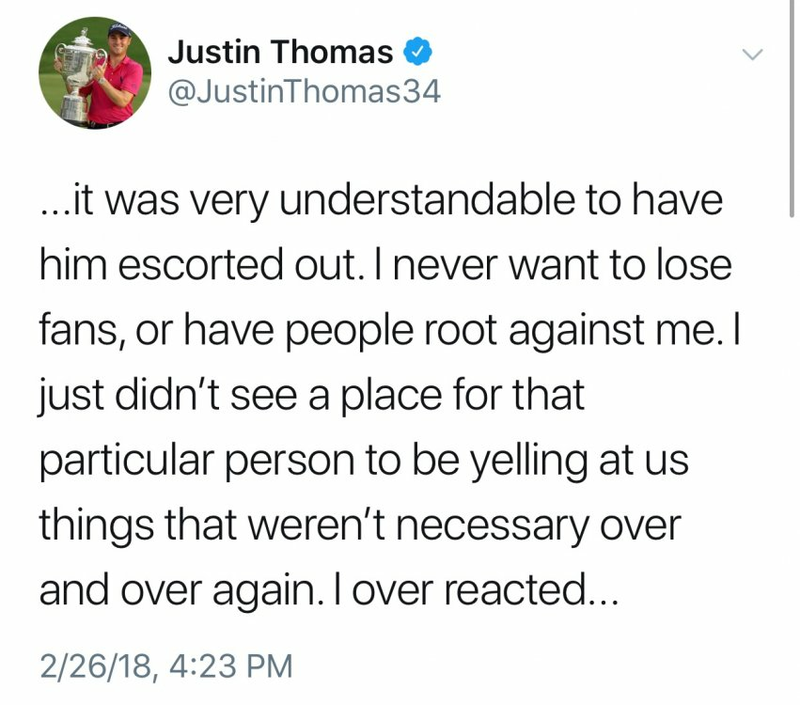 At first glance, I would have agreed with the idea that JT having that guy removed was overkill, but I know there is more to that story and read in one article that Rory even defended JT against a spectator last week for similar behavior. This is golf, and one of the things I have always enjoyed most about golf is that it teaches (or is supposed to) good etiquette. This is something that is considerably lacking in modern day society and I struggle even with my own 6yr old on a regular basis. Golf is one of those sports with plenty of unspoken rules - one of them being, "don't be an A-hole" when participating as a spectator at a tournament. Pretty simple really. On the language bit, I'm glad I wasn't tuned in for that with my daughter present, but I don't fault JT for saying that. Like another said, it was an expression of emotion and was not intended for anyone to hear. Just because there are cameras on the course doesn't mean he's responsible for curbing his enthusiasm. It's the network's job to make sure that such comments don't air to a national audience on live TV. Another thing that I find particularly irritating when people gripe about this is why do we make such a big deal when I can hear the same things broadcast during any NFL game without so much as a peep about it? I literally heard a player this past season say, "F*** you!" during the broadcast and not one story was written about it. The commentators didn't apologize for the broadcast of such language, and I didn't see any online conversations lamenting the usage of obscenities in the NFL. Send the drunkards to an AA meeting and spare me the judgment unless you want to apply it evenly across the board. I would argue that Augusta doesn't put on the greatest tournament the world has ever known. It's a great tournament for certain, but greatest? For starters it has such a weak field for a major that there are regular tour events on both major tours with stronger ones. Also and extremely significantly is that as much as we may love it, the Masters perpetuates the notion that golf is an elitist sport. In regards to the PGA being a money grab - of course it is - it's the professional golfers association - the idea is to make money. They give a lot of it away to charity too unlike like other big, money making sports ventures like the NCAA. Times have changed and people are different. 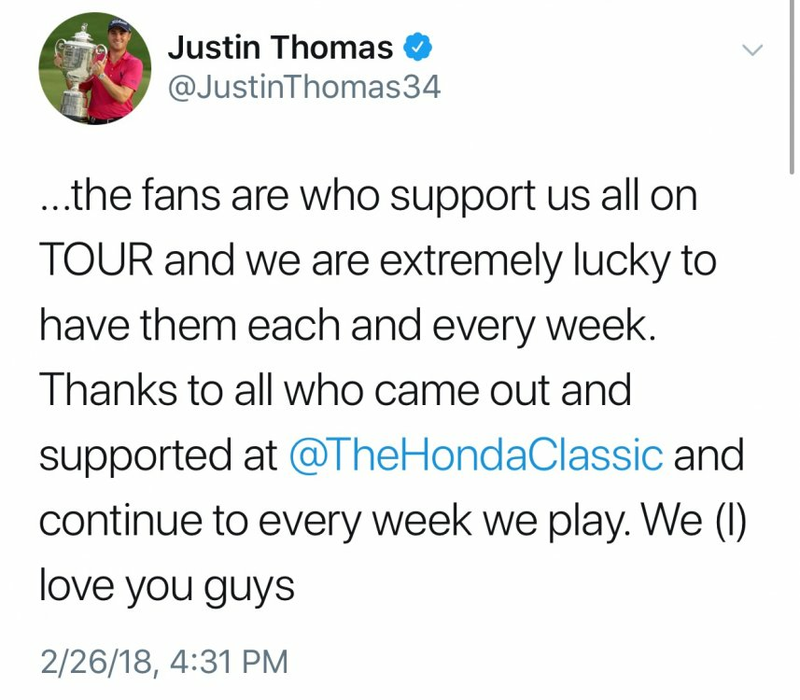 JT and the gang is going to have to adjust to the fact that fans will be different. So long as the noise and negative comments aren't in the process of selecting and hitting the shot they will have to learn to deal with it. The less they say, the less they will deal with it and if they learn to embrace it and have fun with it the crowd will love them all the more. Regardless I like the way JT plays. I wouldn't be rooting his ball into the water. If you don't like him I certainly wouldn't root his ball into a bunker - he'll probably hole it out. I did say Augusta has an air of superiority and I agree completely, the field is the weakest of the majors and they perpetuate the "elitist" stereotype. 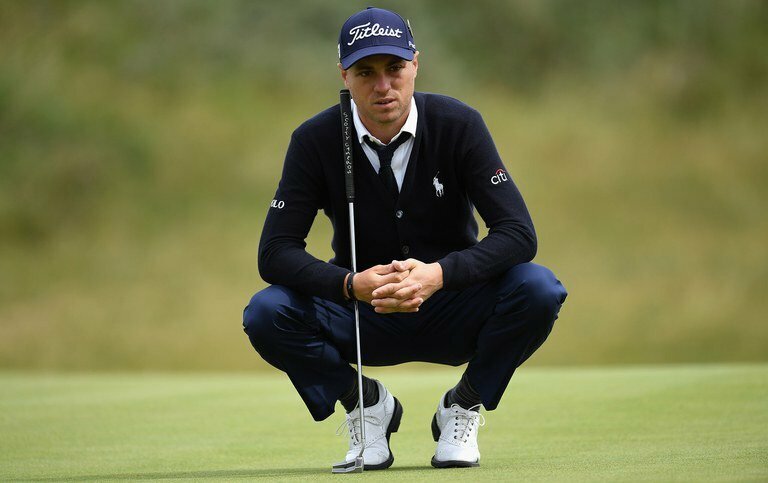 Not one single player has ever said "my dream as a child was to play the Honda Classic" or "I dreamed of wearing a plaid jacket from Hilton Head". If it isn't the greatest tournament, why is it every boys fantasy to be there? Where we can disagree completely is in the operations of the tournament, which was the point of my post. So many minor things that happen in every Tour event were taken from the guys in Augusta. Ropes, graduated scoring, scoreboards, the list goes on and on and on. Imitation is the sincerest form of flattery! On to the "money grab"! 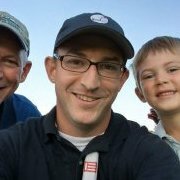 The PGA Tour could make ridiculous amounts of money, still donate millions to charity and stop with the nonsensical desire to play every tournament on a terrible TPC course. They could also demand better television coverage or, better yet, broadcast the events themselves. They are already partnered with MLB Partners who offer the best streaming sports in the world. Every televised PGA Tour event comes complete with 45 minutes per hour of commercial breaks (maybe I inserted a minute or two of hyperbole there, but only a minute or two) . Which is something else The Masters does significantly better then the Tour. At least watching The Masters, you get to see golf! As for times changing, why should the best players in the world be forced to tolerate boorish behavior? If Thomas, Spieth, Fowler, McIlroy, etc. etc. stand their ground and force change, change is exactly what they might just get. And we may all be the better for it! Waste Management aside......your ticket to a PGA Event will tell you what behavior is expected. Some are enforced. some are not. Intoxication definitely is not. I am an ex drinker, but no Puritan. Alchohol, has been part of the sports scene, since well, the conception of the sports scene. I think Thomas, has now put a target on his back. He, will have the rep of a whiner, from tour stop to tour stop. I don't consider him a whiner, but the perception is there. Saying something before a shot, is rude, saying something during or just before is unacceptable, saying something while the ball is in the air, I suppose is the fan's right. Although, it is something older golf fans, like myself, find in the very least unusual. But, this I guess is the NEW golf fan. Profanity, well most of us have gone down that road, and if a player swears, while on mic or camera, well I think that is the by product of the frustration of this game, we love. I'm not condoning it, just saying it's the nature of the beast, at times. Some players swear more than others, J.T. seems to do it often, Pat Perez is in a league of his own. When, Shane Lowery, hit his ball out of bounds, and called himself an expletive idiot !!! I actually chuckled. 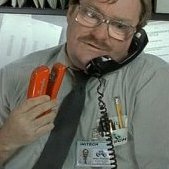 My pet peeve is this, Mashed Potatoes, Ba Ba Looey andf all that nonsense, my punishment, 1 warning, then if it happens again you get Gary McCorded for life. Remember McCord and Augusta???? When Jack beat Arnie at Oakmont the fans were brutal towards Jack. When asked about it, Jack said he never heard them. I think these young guys should learn from Jack, and just play their game. I certainly don't condone the fans behavior, but the behavior will continue as long as it gets a reaction from the players. For whatever reason, the following came to mind while reading this post. Recently, a local kid passed Allen Iverson's state single season scoring record. He is a social media and internet sensation with his "monster dunks" which have regularly appeared on ESPN and other media outlets. There are no fewer than 6 Twitter handles geared specifically toward following his every move. But being an internet sensation doesn't guarantee success in terms of wins and losses. His high school team consists of three D1 recruits but they have lost sight of the "team" concept. Rather than game-plan against the opponent, they game-plan to get the kid highlight reel dunks. His coach promised him before the season, on Twitter no less, he would do everything in his power to get him Iverson's record. On Saturday, they lost the regional championship game by 16 points to a team that isn't likely to send any member to the next level, any level for that matter, of college basketball while being held to 15 points below their previous season low team score. The reason I bring this up is the school's Twitter account has been rampant this week with "our kid has 150K Twitter followers, your school doesn't have 150 people on Twitter" and "our kid has been on ESPN, your school can't find ESPN on TV". The social media mindset seems to think this kid has achieved some great milestone because of how many Twitter followers he has. And based on those social media posts, believe NBA riches are guaranteed as a result of his social media success. I'm not sure what my point is other than to say, social media has distorted life in general for lots of folks. "How many likes did I get" or "how many retweets did I get" seems to be a badge of honor that younger generations strive to achieve. I guess I'm showing my age a bit but it makes no sense to me. I think there is a lot of this mindset in the "mashed potatoes" guys attempting to get noticed for being a douche. I thought I would share. Not sure how relevant it is?!?! ?